I don’t know why some of the really hard things to live or comprehend in the spiritual realm have risen as a cloud recently. So I was drawn to what I wrote September 22, 2010. 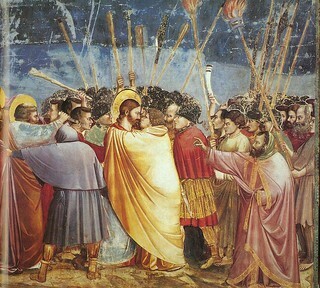 Judas, the betrayer, back-stabber, death kisser, is a syndrome widespread in the church. Revelation, which has been buried under nonsense, is about Judas (Judas Iscariot’s name does add up to 666). The whole book is about holding on, steadfastly, not giving up or giving in, and the consequences of betraying Jesus. Jesus did nothing to deserve the betrayal. The prophets were murdered and persecuted exactly because they did nothing wrong, but served God completely (usually without the art of diplomacy). So we will be, as you say, persecuted. Sometimes because we carry no fault in ourselves at that time. We are to pray for those who use us spitefully, not apologize to them. While we are all sinners (some of us saved by grace) we are not always abused because of our sin. Sometimes to be indignant may be right in naming an evil. But sometimes the Calvary answer is required, “Forgive them; they don’t know what they are doing” (Luke 23:34). I admit (confess?) that my initial reaction is centred in my own pain, and not on Jesus Christ. As I discipline myself afterward, I find two things help. 1. Sorrow and worry about the soul of the persecutor/betrayer. I can pray for that (after awhile). 2. The other is that when I stand before Jesus after my physical death I don’t want Jesus’ sad eyes looking at me because I used the behaviour of others as an excuse to sin or stay in sin. I want Jesus to look at me and recognize a servant. Dr. Charles Stanley says that if we practice thankfulness in our prayer and life, we will stay (or return to being) focussed on Jesus, and not on the one causing the pain. That was like a flash of new spring life, and I have been deeply digesting that ever since (still a way to go). But that does raise the question, does God sometimes actually send a Judas to us to test us and refine us? I hope not! After all, there seem to be so many of them. Sometimes is this more to do with God using a situation to work good for us when we love God and walk in the call of God upon us (“We know that all things work together for the good of those who love God—those whom he has called according to his plan” Romans 8:28 God’s Word)? Thank you for your insights. Perhaps whoever “causes” things is never the issue, but our faithfulness is. Thank you for this post, I can relate to it. I have had a Judas in my life, who was reporting back to the “church” with my movements during a prayer group that had began in my home. Jesus warned me of the Judas through scripture, a dream and then one morning as I was praying He came to me and told me where the Judas would be seated at that day’s prayer group. Everything He warned me about happened down to the last detail. In answer to your question, I think that the enemy sent the Judas to try to stop what we were doing, but ultimately God allowed that to happen to teach us that we can trust Him. I think that it is also becoming part of the “fellowship of His sufferings”. God bless! Have a blessed day, dear brother!